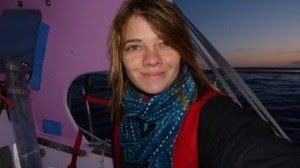 Jessica Watson has celebrated her New Year in the Southern Ocean, (19 hours behind AEDT) at a latitude of 55 degrees South, by helping herself to a bag of treats packed by her mother. In calm and somewhat warmer conditions today, which marks day 75 of her solo circumnavigation, Jessica has also been accompanied by two Albatrosses and captured images which she has posted on her blog. But there is just one wish as part of the teenager’s New Year’s Resolution – to sail safely back into Sydney. “My New Year’s resolution is an easy one. Sailing back into Sydney later in the year is the number one priority. At this stage we are right on track and despite being becalmed today, it’s been a really productive week. A nice way to bring in the New Year actually,” said Jessica. Jessica is now less than 1,200 miles from rounding Cape Horn. I've had a very different day again. We've spent the day almost completely becalmed. But the novelty of having a clear sky, sunshine, slightly warmer temperature and the company of two Albatrosses that kept me from getting too frustrated. There was so little wind that even the Albatrosses were flapping their wings today. I know a lot of you have requested some pics, so I had the chance to get some close ups today as they kept landing on the water right next to Ella's Pink Lady (see pics below). An Albatross taking off without any wind is very clumsy, as they have to flap hard to lift themselves off the water which is very out of character for such graceful birds! I also caught some vision on video (see Videos section of my website). So it's now New Years Eve for me and now just 5 minutes away from midnight (see pic below). There's quite the wild party planned out here, all the big names from miles around are attending! Entertainment will include party poppers and a range of my favourite treats will be served - believe me, the treats are one part that you really don't want to miss! This makes it the second New Year in a row that I've spent at sea. Last year I was out in that Tasman sailing another 34footer to New Zealand. As it was only the third day out and a bit bouncy, we were still all feeling a bit queasy. So the treats that Mum had packed for us last year were completely ignored. But not this year!! Deciding on my New Year's resolution wasn't exactly hard. I think that getting back to Sydney safely will be quite enough of a challenge and my main wish for 2010! Happy New Year everyone and thanks so much again for all your support! AMERICA'S CUP: BRING BACK THE SPORTSMANSHIP! Speed & Smarts... how-to tips for racing sailors. Is it a bird, is it a plane….? One more fantastic day on the Harbour. Who will win the Gold Star in Rio?